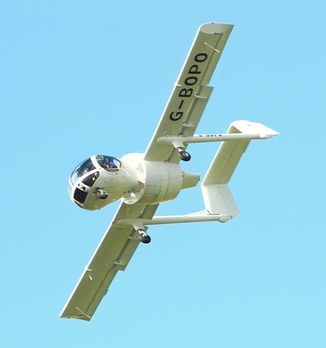 The Edgley EA-7 Optica is a British light aircraft designed for low-speed observation work, and intended as a low-cost alternative to helicopters. 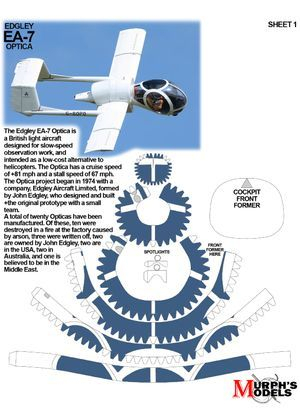 The Optica has a loiter speed of 81 mph and a stall speed of 67 mph. The Optica, powered by a 160 hp Lycoming IO-320 engine, made its maiden flight on 14 December 1979 when it was flown by Squadron Leader Angus McVitie, the chief pilot of the Cranfield College of Aeronautics. The aircraft has an unusual configuration with a fully glazed forward cabin, reminiscent of an Alouette helicopter, that provides 270° panoramic vision and almost vertical downward vision for the pilot and two passengers. 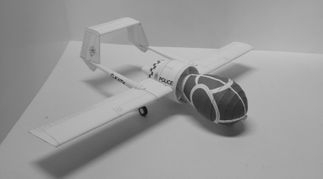 The aircraft has twin booms with twin rudders and a high-mounted tailplane. It is powered by a Lycoming flat-six normally-aspirated engine situated behind the cabin and driving a fixed pitch ducted fan. Due to the ducted fan, the aircraft is exceptionally quiet. 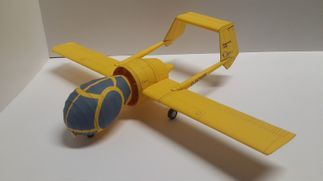 The aircraft has a fixed tricycle undercarriage with the nosewheel offset to the left. The wings are unswept and untapered. The aircraft is of fairly standard all-metal construction with stressed skin of aluminium. The aircraft's distinctive appearance has led to it being known as the "bug-eye" in some popular reports. The Optica, upgraded to the more powerful Lycoming IO-540, entered production in 1983. Edgley Aircraft Limited obtained its initial Civil Aviation Authority certification on 8 February 1985. A total of 22 Opticas have been manufactured, and construction of a twenty-third began but was not completed. Ten aircraft were destroyed in an arson attack at the factory.